A new concept from the card maker, Topps Living Set Baseball takes an open-ended approach to collecting MLB cards. Instead of a standard release that lasts for one year, the online-exclusive Topps Living Set Baseball has no end in sight. 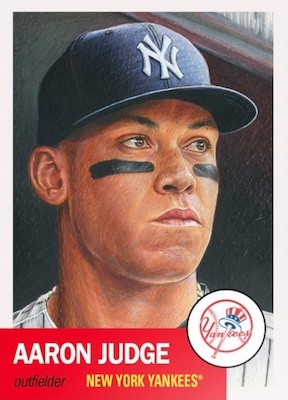 While not confined to one specific duration or even a certain period of collecting, Topps Living Set Baseball pays tribute to the 1953 Topps design using high-resolution images of hand-drawn artwork from the legendary artist Mayumi Seto. Of course, there are some rules. Printed on 16-point vintage stock, each card is sold for one week and three new cards are announced every week. Single cards sell for $7.99 and three-card sets go for $14.99. 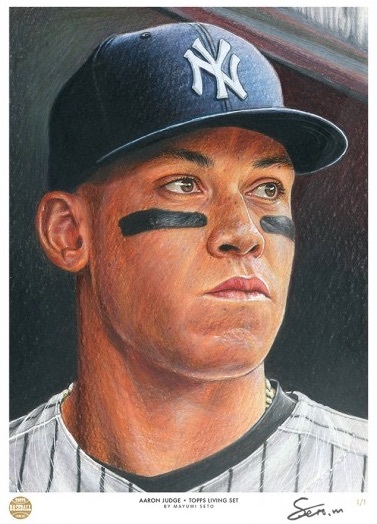 View current Topps Living Set Baseball cards on Topps. Also, the Topps Living Set Baseball checklist only includes one option for each player, unless that player is traded. 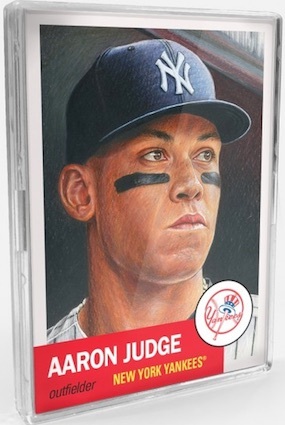 So, there is no need to worry about a new Aaron Judge card every week of the set. Card backs note the batting and fielding stats for the most recent year (when issued) and the lifetime stats from the same point in time, just like the 1953 set. 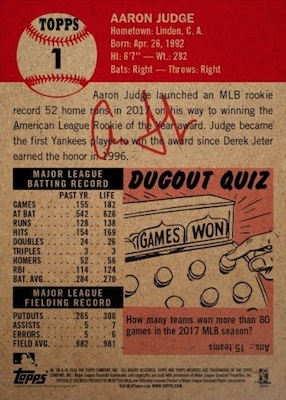 Starting after the century mark for the Topps Living Set Baseball checklist, Topps rolled out limited 10" x 14" prints for the previous 100 card images, with five issued per week. The Limited Edition Fine Art Prints come on premium cotton paper (1/64") showcasing detailed scans of the Mayumi Seto artwork. The base prints are hand-numbered to 100 copies and the price fluctuates based on the player. For instance, Aaron Judge is $64.99 and Joe Panik is $29.99. Each player also has a one-of-one Gold Foil Logo version signed by the artist and priced at $299.99 and up. The Topps Living Set Baseball checklist is offered in standard order of release, listed in order of final print run, and also grouped by team. Print runs (PR) will be added when announced. Each release includes 3-card set or individual cards. Shop for Living Set Baseball cards on Topps. Grouped by MLB team listed on the card. Baltimore Orioles - 106 Cal Ripken Jr.
Boston Red Sox - 9 Jackie Bradley Jr.
San Diego Padres - 173 Fernando Tatis Jr.
Toronto Blue Jays - 74 Lourdes Gurriel Jr. In order of total print run from highest to lowest. Does anyone know if they will be releasing the print runs on these at weeks end? How about the retired Set? Dead Set? How is the print run different among the 3 cards? I thought they were purchased together. Each week has a three-card bundle for $14.99 or you can purchase a card individually for $7.99. I’m not a huge collector but having these cards to look forward to each week is awesome. One of a kind set that i feel alot of thought and effort is put i to into it since its only 3 players a week 156 a year. Classic boarder design with the vintage style backs are so smooth looking with the original artwork. Following the lowest print run will tell you how many true sets there are, and right now i think its under 3.5k. Crazy thinking that there will be that few of full sets for something that can run forever. Trey can you tell me what pt size these cards are considered? The Living Set cards are printed on 16pt vintage trading card stock. Love the idea of the set and the look of the cards. A few early production hiccups as far as production quality on Topps end, but hopefully that will be ironed-out soon. Really looking forward to seeing more HOFers, Retired Players and gotta have some RC’s!!!! GREAT SET! I really like the idea of the set, but I’ve received my first three and the Castellanos card has some notable printing issues. The store I am purchasing from also had to return the Hoskins card for the same reason. Anyone else experiencing these problems? Great set! As mentioned above a lot of thought and effort went into the design of the set. I hope they limit the number of retired players as I look more forward to current players and hopefully rookies. I do wish it was a thicker card stock but understand why they went with the 16pt vintage as it was the thickness of the set in the 50s. love this set…if the card stock was thicker it’d be even better, but they look great and different from the glut of cards issued these days…. Great set. But the Way they ship is awful .. so much damage to cards. This is an awesome product. There’s no autos, relics, or other gimmicks to the set. Just a good base set, with great artistic photos from a classic 50’s card. The main reason it doesn’t get 5 stars from me is because I’m Canadian and Topps makes me pay $10 US for shipping on every purchase every week. I understand the market in Canada is small, but there could be a bundle type of shipment that could possibly be sent out monthly at $10/month instead of $40. I love the idea behind this and the card designs look great! I was hesitant at first, but I really love the design and simplicity of the set. Is this going to be released each week indefinitely or will production pause during offseason? These 2018 Topps Living Set cards are an absolute beautiful piece of artwork on a baseball card. I’ve collected every card released to date & now waiting on the latest ones in Hedges, Scherzer, Buehler, & Haniger to arrive. Bought some on eBay & some on Topps. I’ve found out that if you wait a few days to a couple of weeks after release of each Living Card/Set eBay sellers seem to have them a bit cheaper than buying directly from Topps. However, I should note that some sellers of these Living Sets/Cards are having problems receiving the cards in a timely fashion from Topps. I had this happen to me on the Ronald Acuna card. The seller in which I purchased the card from on eBay listed a timeframe to ship/receive the card but Topps was very late in getting his Acuna Living Set cards to him. Therefore I was waiting weeks & weeks before I finally received the Acuna card from him. He did send me one that was best centered & in a magnetic case for my troubles even though it wasn’t his fault. Thanks. Beautiful art. 1953 Topps design is one of my all time favorites. Really like the concept. I really love this set, gives me something new to look forward to every week. The cards are classy and the set is manageable. Current sets are difficult to build a master set beyond the base set. The print runs are low making all the cards in the set truly limited. I haven’t got any damaged cards. I will continue this set for as long as I can. Wish I started collecting the first week this set released. Huge fan of the artwork and I like having something to look forward to in the mail every week. I still cannot believe that scooter gennett hasn’t been put in to any of Topps subset cards!? I wish I started collecting the set from the 1st two or three weeks. those weeks are going to be tough to get, plus they are a bit expensive. I have all weeks starting with card #20 so my set will more likely be incomplete. picking up a few that I need. a couple of things that I would like to know is will this set continue through the off season(November through February). will the players that just had cards, will they be getting a new card and what if they go to another team like Murphy, Ramirez. I’m sure those fans would like to get them in their new unis b4 they get to a new team again. No word on if the set runs 52 weeks a year or if there is an offseason. All players are eligible for one card per team, so any trades open them back up for being used again. However, given how many players remain, it is probably a bit early to expect repeat players already. Trey, I think Topps said they are running this Living Set 52 weeks out if the year, Wow can you imagine how many cards we would have after 2 years of collecting and I do not see the price rising for the full set. How can you not love collecting this set or 2 or 3 of them !!! Everything about this set is fantastic from the art work to the vintage design to the enjoyment of collecting. I would give it more stars if I could ! I am very happy that Topps has chosen to print these cards on a low quality card stock that will degenerate itself in 6-8 years…. Started with Babe set. Now I have 3 of the bottom 5 and 4 of the bottom 7 in terms of print run. The others come from the first few weeks. Maybe people were unaware then. I was. Probably too soon to tell what this means. Are people now becoming less interested? Is $15/week causing the lower numbers? The resale market on Ebay is all over the place. I think an undergraduate economics paper is here somewhere. Love the cards. love this set. It’s a great idea. Quality cards for sure.